The Collegiate Rocket League National Championship will be contested in front of a live crowd for the first time this year, as the top four teams head to Arlington. The college sports season is well underway and that means that the college esports seasons are also going strong. With the end of October fast approaching, it's time for some games to look ahead to how they'll determine their championships and, on Monday, Psyonix and Tespa issued new details on Rocket League's college championship event. 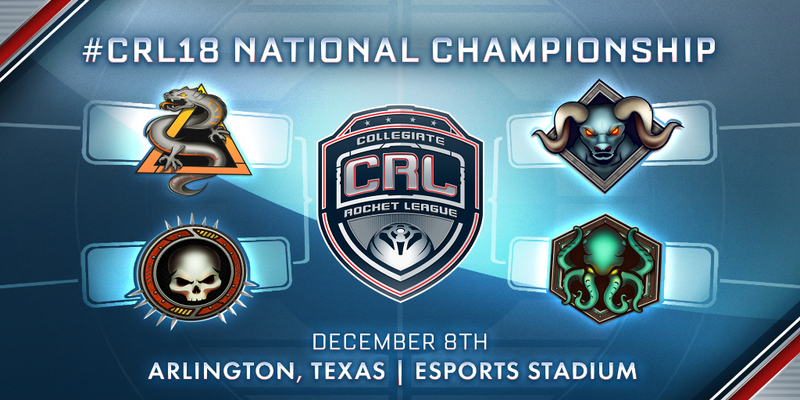 The Collegiate Rocket League (CRL) National Championship will take place on December 8, as the top four teams in North America battle it out for supremacy from the Esports Stadium in Arlington, TX. There will be $25,000 in scholarships at stake in what's being billed as the first live collegiate Rocket League event, with spectator activities available throughout the day. The semifinals and finals will all unfold over the course of a single day, with the top four competing in a double elimination bracket. Over 250 schools have jumped into this second season of Collegiate Rocket League. Three weeks of Conference Play remain, with 400 teams being whittled down to just four. For more details on the CRL National Championship event, be sure to visit the Rocket League Esports website. And for more on Tespa, be sure to revisit our interview from earlier this year.